The African American Intellectual History Society (AAIHS) is pleased to announce the 2019 Pauli Murray Book Prize for the best book in Black intellectual history. 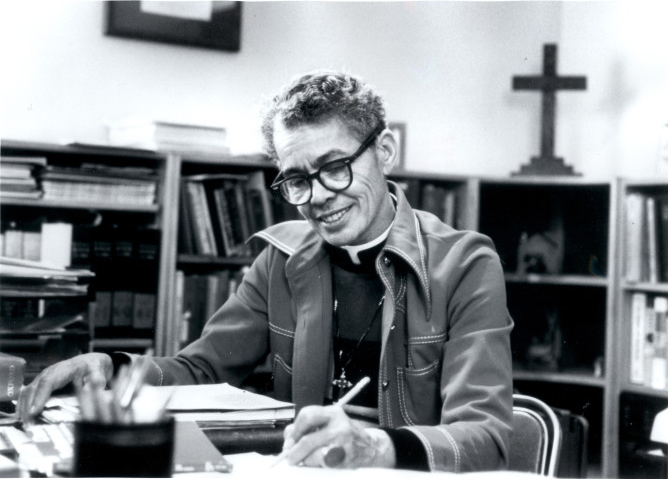 Named after lawyer, author, and women’s rights activist-intellectual Pauli Murray, the prize will recognize the best book concerning Black intellectual history (broadly conceived) published between January 1, 2018 and December 31, 2018 by a member of AAIHS. AAIHS board members are not eligible. The winner of the 2019 Pauli Murray Book Prize will receive $1,000, a featured week-long roundtable on the book in Black Perspectives, and a featured interview published in Black Perspectives. The prize is open to scholars at all stages of their academic careers. Five finalists will be announced and their books will be featured on Black Perspectives during the first week of March 2019. The award winner will be announced at the 2019 AAIHS Conference, which will be held at the University of Michigan from March 22-23, 2019. One copy of each entry, clearly labeled “2019 Pauli Murray Prize Entry,” must be mailed directly to each of the committee members listed below. Bound page proofs may be used for books to be published after October 1, 2018 and before January 1, 2019. Books may be sent by the author or the publisher. Please note that authors who are not AAIHS members will not be considered for the prize. Membership must be current by October 1, 2018. All submissions must be postmarked to each committee member by October 1, 2018.